Huxley (May, 4, 1825 - June 29, 1895) was born in Ealing, near London, the seventh of eight children in a family that was none too affluent. At 21, Huxley signed on as assistant surgeon on the H.M.S. Rattlesnake, a Royal Navy frigate assigned to chart the seas around Australia and New Guinea. Huxley collected and studied marine invertebrates, in particular cnidarians, tunicates, and cephalopod mollusks. 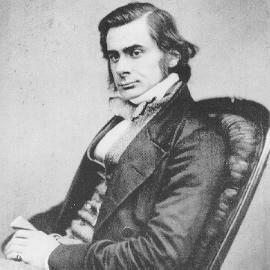 After leaving the Navy in 1854, Huxley managed to secure a lectureship at the School of Mines in London. Huxley was a passionate defender of Darwin's theory -- so passionate that he has been called "Darwin's Bulldog" – and also a great biologist in his own right, who did original research in zoology and paleontology. He is best known for his famous debate in June 1860, at the British Association meeting at Oxford. His opponent, Archbishop Samuel Wilberforce, was not-so-affectionately known as "Soapy Sam" for his renowned slipperiness in debate. 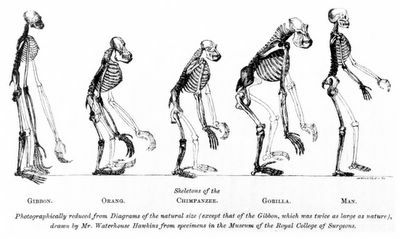 During the debate, Archbishop Wilberforce ridiculed evolution and asked Huxley whether he was descended from an ape on his grandmother's side or his grandfather's. Accounts vary as to exactly what happened next, but according to one telling of the story, Huxley muttered "The Lord hath delivered him into my hands," and then rose to give a brilliant defense of Darwin's theory, concluding with the rejoinder, "I would rather be the offspring of two apes than be a man and afraid to face the truth." All accounts agree that Huxley trounced Wilberforce in the debate, defending evolution as the best explanation yet advanced for species diversity. However, Huxley did not blindly follow Darwin's theory, and critiqued it even as he was defending it. In particular, where Darwin had seen evolution and a slow, gradual, continuous process, Huxley thought that an evolving lineage might make rapid jumps, or saltations. As he wrote to Darwin just before publication of the Origin of Species, "You have loaded yourself with an unnecessary difficulty in adopting Natura non facit saltum [Nature does not make leaps] so unreservedly." Huxley's most famous writing, published in 1863, is Evidence on Man's Place in Nature. This book, published only five years after Darwin's Origin of Species, was a comprehensive review of what was known at the time about primate and human paleontology and ethology. More than that, it was the first attempt to apply evolution explicitly to the human race. 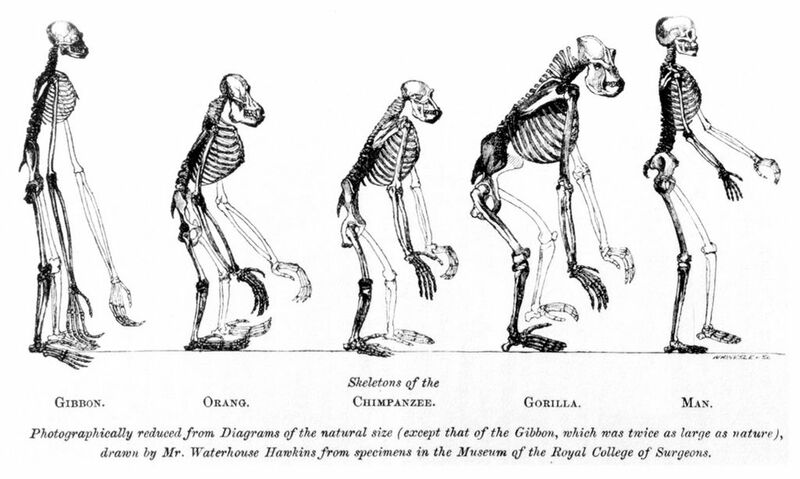 Huxley explicitly presented evidence for human evolution. Huxley founded a remarkable dynasty of English scientists and thinkers. His son Leonard was a noted biographer and "man of letters." Leonard's oldest son Julian was one of the authors of the evolutionary synthesis of the early 20th century; Julian's son Francis became a noted anthropologist. Julian's brother Aldous Huxley was a novelist, screenwriter and essayist; his best-known book is the anti-utopia Brave New World.